December 18th, 2009 04:31 AM | by William Bell | Eschatology. Is America complicit in Shedding Innocent Blood? One of the charges God made against the ancient nation of Israel was that their hands were defiled with blood and their fingers with iniquity. For this reason, God would not hear them because their iniquities had separated them from Him, so they he refused to hear. Isaiah went on to say that the acts of violence is in their hands. Their feet run to evil, and they make haste to shed innocent blood: Their thoughts are thoughts of iniquity. Wasting and destruction are in their paths. The way of peace they have not known and there is no justice in their ways. They have made themselves crooked paths; Whoever takes that way shall not know peace.” (Isa. 59:6-8). This text could have been published on any of the major news networks such as CNN, ABC, CBS, or the BBC or Al Jazeera. It would be a pretty accurate description of modern day Zionism and the Apartheid, Colonialist, illegal occupation and confiscation of Palestinian land and the brutal ethnic cleansing of its people. Like Judas who betrayed the Christ, other nations and U.S. Corporations are complicit in accepting the blood money of Israel. South Africa was built on the backs of Black labor as was America on the backs of Black Americas. Israel however does not want Palestinians and therefore carries out a slow process of genocide. What is happening to the Palestinians is akin to what happened to the Aborigines of Australia and the American Indians. Israelis are charged with destroying food supplies and contaminating the water supplies. Some Palestinians in Gaza are paying 25% (twentyfive percent) of their income just for water which they must import from other Arab nations. It is an attempt to wipe out Palestinian history and all memory of them from the earth. The UN General Assembly report representing 192-member world body approved a resolution with a vote of 114 to 18, with 44 abstentions and 16 countries not voting. Israel’s Foreign minister claimed the resolution did not have the support of the “moral majority” of the Western nations! What arrogance! The world has spoken, Western approval or not. That says quite a bit about how Zionists feel about “shedding innocent blood” and the Western nations who refused to vote against them. 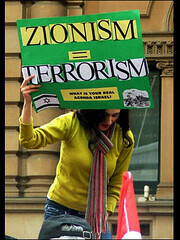 Seems many of our politicians have drunk the Jim Jones Kool-Aid of Zionism and are staggering in their cry for justice. Ohio Congressman Dennis Kucinich says in light of the Goldstone report charging Israel with war crimes and the refusal of US politicians to consider the report in blind support of Israel, is to pretend that war crimes were never committed and that such deception was the nullification of humanity. Pilate tried washing his hands clean of the blood of Christ. But blood stains are not so easily removed. Maybe the West is waiting for Palestinians to be placed in gas chambers before they can agree war crimes against humanity are committed by Zionist Israel. In the meantime, a country which should know what Apartheid is, has already spoken. « But of That Day and Hour Who Knows?